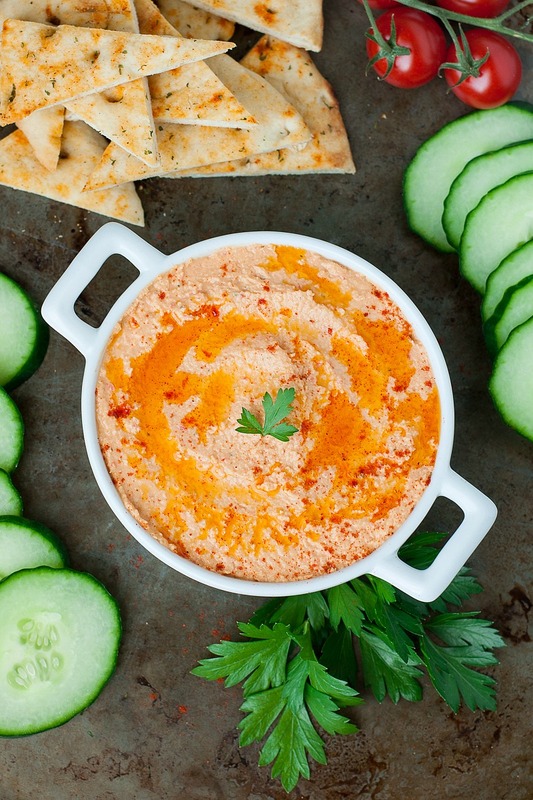 Whip up this quick and easy roasted red pepper hummus and snack happy! This creamy chickpea dip pairs great with carrots, cucumber, celery, and pita wedges. The other day my phone went missing. In light of recent mishaps, I proceeded to approach with extreme caution and cover all the necessary bases: the oven, the fridge, the freezer, the toilet, and the laundry basket; in that order. 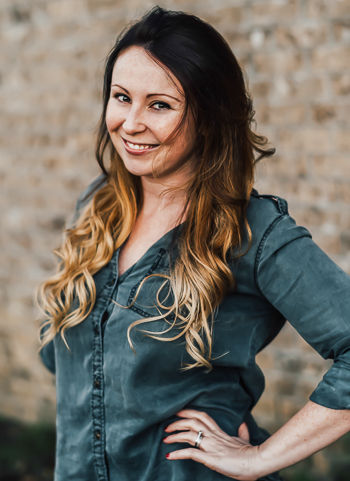 Much to my surprise, my phone was safely nestled atop the sofa cushion, where I myself had been sitting when it suddenly went missing. Phew. I don’t think Apple’s protection plan covers baked phones, and I don’t know about you, but I’m certainly not eating it. Recipe yields 12 servings at 1/4 cup each. *tip: remove the skin from the chickpeas for extra creamy hummus! I decided to go the old fashioned route and soak dried chickpeas overnight and then boil them the next morning before making the hummus. Why I do these things when I have a baby scaling my leg like a spider monkey I haven't a clue, but I did it, and it was delicious. You can also cook them via crock-pot or just skip the song and dance and grab a few cans of beans; it's all good! Grab your chickpeas and, as mentioned above, remove any loose or easily-peeled skins for a creamier hummus. In a food processor or blender, combine chickpeas, red pepper, tahini, and olive oil and blend. Scrape down the sides and add your garlic, salt, red pepper flakes, basil, cumin, and paprika. Before you crack open your lemon to juice it, scrub it clean and zest it into a small pile on your cutting board. Trying to zest a lemon after you've juiced it is like trying to get dressed when you're still sopping wet from a shower. It's just plain difficult and a bit uncomfortable. Add as much or as little zest as you'd like to the food processor. I used around half a lemon's worth in mine and sometimes get gung-ho and just add it all. You can always swirl it in later if you have a change of heart and want more lemon. Unlike baking, cooking [or in this case blending your brains out with a pile of chickpeas] is much more forgiving. In fact, if you're a flavor junkie like I am, amp up your hummus with extra garlic, cumin, and basil, if desired. You can also zestify your hummus with extra red pepper flakes or cayenne pepper! Taste and tweak to your hearts content. Now that we've gotten gloriously off task, add the lemon juice and zest to the processor and continue to blend and whip your chickpeas into an orange flurry. Top with a hearty drizzle of your favorite olive oil [I broke out the harissa-infused evoo for mine! Yum!] and a sprinkling of paprika [or cayenne if you're feeling bold!] and dig in! Don't forget to grab some pita chips, warm fluffy pita bread, cucumber slices, carrots and anything else you'd like your hummus slathered on! 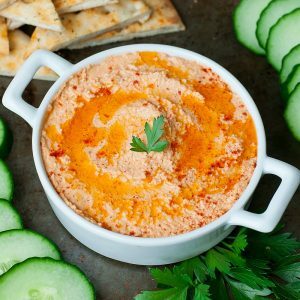 I’ve been trying to master a roasted red pepper hummus for while, can’t wait to try this recipe!! This is the perfect flavor for hummus, Love it so much! I just made my first ever batch of homemade hummus last weekend, which means I feel brave enough to tackle this. It looks delicious. Mmmm harissa olive oil? Not that the hummus doesn’t sound good but I need to get me some of that! Okay. i am getting a food processor. 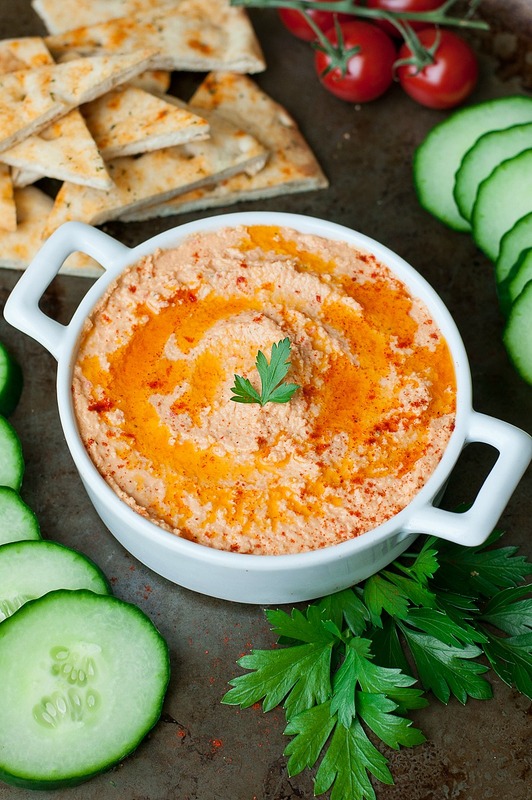 I love roasted red pepper hummus, so I bet this homemade version is AMAZING! I will definitely be making this! I LOVE LOVE LOVE red pepper hummus and have been thinking of trying to make my own. If I grabbed canned chickpeas are they just good to go out of the can? This comes at just the right time. It’s looking like Trader Joe’s may have pulled their chipotle hummus and this looks close enough with a little doctoring spice wise I might not be thrown into a twitching heap! Thanks! !